This show is one of the licences for which Funko has created the most figures. It is not far behind Game Of Thrones or Star Wars but it will soon be caught up by Harry Potter. You can find several versions of the most important and popular characters like Rick Grimes, Daryl Dixon and Glenn. But with every season, Funko release a series of new characters like Carol, Maggie, Hershel, Michonne or Merle. Of course Funko didn't forget the zombies and you can find some of the most iconic ones as pop figures. 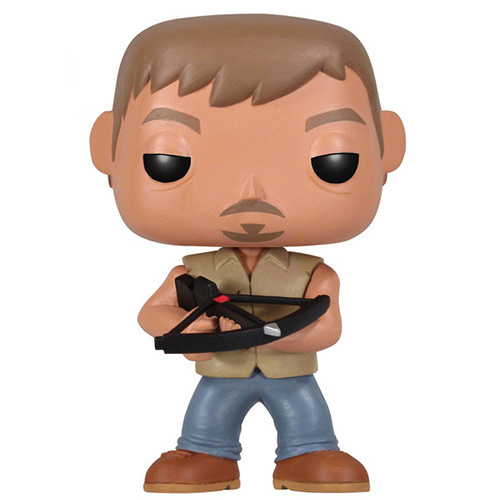 Of course, you can also find Daryl's famous chopper as a very detailed and popular Pop! Rides. The Walking Dead is the TV adaptation of the famous comic books by Frank Darabont and Robert Kirkman. After a mysterious epidemic, most of the world's population has been turned into zombies or "walkers" as they are called in the comics. At the beginning of the first season, sherif Rick Grimes wakes up in an abandoned hospital after a six months coma. Since he fell into that coma at the very beginning of the epidemic, it's a whole new world he's going to discover. As Rick sets up to find his wife and son, he slowly gathers a group of survivors and becomes their leader. Together they will face the dangers of a post apocalyptic world, not only the zombies but also some men who are willing to do anything to survive. Are you interested in the walking dead figures ?